The Big News: No one is safe from The Undisputed Era! The show once again ended with Adam Cole, Bobby Fish, and Kyle O'Reilly standing tall over a beaten foe, this time laying out Wolfgang. The Medium News: Minutes before that, Wolfgang came up short in his shot at dethroning Pete Dunne as WWE United Kingdom Champion. The Little Beaver-sized News: Nikki Cross turned babyface as she teamed with Ruby Riot to defeat The Iconic Duo. Mr. Regal told Riot last week to get a tag team partner because he wouldn't sanction a handicap match, but Riot didn't get one, so this began as a handicap match anyway. A minute into the match, with Kay and Royce having the advantage, Cross crept out from the backstage area to observe things. Kay accidentally hit Royce with a punch to the face, which led to Riot's comeback. As Riot began fighting, Cross jumped onto the ring apron and tagged herself in, which apparently is perfectly legal. The fans loved this as Cross destroyed both Kay and Royce, laying Kay out with a twisting fisherman's suplex. Cross tagged out to Riot and left the ringside area before Riot pinned Kay with a top rope senton. We got a recap of Johnny Gargano's altercation with Tino Sabbatelli and Riddick Moss in the Performance Center from last week. This led to the announcement of a match later tonight. Backstage, No Way Jose called Lars Sullivan a freak. Jose was just trying to fiesta with the fans in Brooklyn when Sullivan attacked him. He also brought up Sullivan laying him out last week and challenged him to a match next week. Moss was the one to accept the challenge, and he had Sabbatelli in his corner. These three and Tommaso Ciampa had a tag team match back in May, which was DIY's last match on television before breaking up. Moss spent the first few minutes ragdolling Gargano, then Johnny Wrestling tried to get something going before running face-first into Moss' massive elbow. Moss beat on him for close to five minutes until he made the mistake to bellow that Gargano is nothing without DIY, which spurned Gargano's comeback. Sabbatelli tried interfering, but it was to no avail as Gargano managed to lock on the Gargano Escape. Moss powered his way to the ropes, which befuddled Gargano. Gargano pulled himself together and won with a slingshot spear. I hope the importance of Montez Ford's Solo Cup is explained one day. Their opponents this week were the returning Ealy Brothers: Gabriel & Uriel. The Ealys are not only winless on TV, but they also once upon a time got destroyed by a rampaging Samoa Joe. Uriel started with the biggest heat you can imagine: he stole Angelo Dawkins' headband! That fiend. After that -- it was on. They gave both Ealys the Midnight Express leapfrog on the ropes, but they got a brief heat segment on Ford before Dawkins tagged back in. The Profits then won with their combination spinebuster/frog splash before celebrating in the crowd. Up next was a video package looking at the entire two year run of the undefeated, undisputed, all-time record holder NXT Women's Champion: Asuka. Aleister Black will do a promo next week. Christy St. Cloud interviewed Wolfgang, who said he's never been more ready for a match in his life. He beat Tyler Bate a few weeks ago and tonight will take the UK title from Pete Dunne. Dunne refused a promo a few minutes later. Dunne and Wolfgang teamed together to defeat Moustache Mountain last month. Before that match, Wolfgang had told Dunne that he wanted a title shot -- so here we go. I know I say this every time he wrestles, but Dunne is a star. It cannot be said enough how much that Chicago match with Tyler Bate made him a bigger star to the US crowd. Wolfgang was content with trying to outwrestle the champion, but Dunne decided to battle back with punches and a DDT on the ring apron, which is the hardest part of the ring. Back in the ring, Dunne slapped on a double wristlock, but Wolfgang powered out of it and turned it into his own suplex. Wolfgang moved like a cruiserweight as he used a tope and a lionsault, but Dunne fought back with an Ex Plex. Wolfgang came back and went for a Swanton, but Dunne got his knees up and turned it into an armbar. Finally, Dunne finished off his foe with the Bitter End. This was probably the worst of the UK title matches, but it was still really good. Just when you thought the show was over, out ran The Undisputed Era! 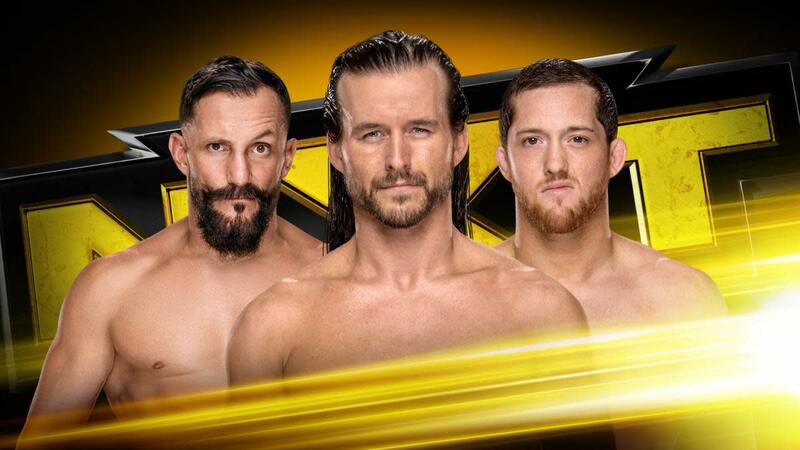 Adam Cole, Bobby Fish, and Kyle O'Reilly confronted Dunne. Dunne got in one punch before being beaten by all three men. Wolfgang ran in for the save, but he got overwhelmed as well. Dunne, who was saved by his former partner...turned around and walked away. He teased returning to the ring, but it was only for his championship belt. Cole finished off Wolfgang with a superkick before leaving through the crowd. Tyler Bate and Trent Seven ran down to check on Wolfgang as the show went off the air. Mr. Regal informed Cole, Fish, and O'Reilly last week that there would be no more out-of-the-ring attacks, so they followed his orders and still caused chaos in the process. So, that does it for another fun week at Full Sail. Until next Wednesday, remember to say your vitamins and take your prayers!